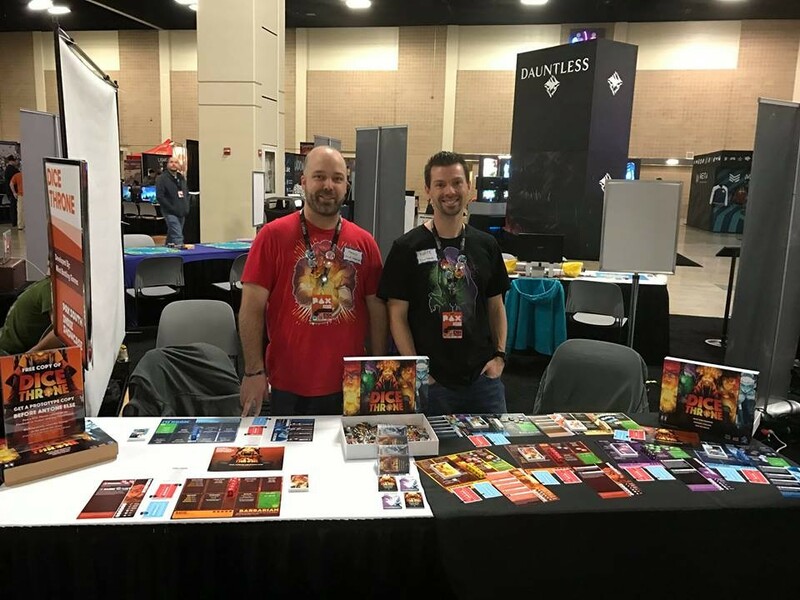 When Manny Trembley and Nate Chatellier showed up to the first day of the PAX South gaming convention in Houston last month, the Kickstarter project they set up to fund their game Dice Throne had already reached its modest goal of $15,000. This happened in less than 48 hours. Today, with 13 days left in the campaign, Dice Throne has received nearly $69,000 in pledges from more than 1,300 backers. The Spokane-based game creators were at PAX (a regional version of the all-encompassing gaming convention started in Seattle by the creators of the Penny Arcade webcomic) because Dice Throne was chosen as one of eight featured games for the convention's Tabletop Indie Showcase. There, Trembley and Chatellier spent three days, Jan. 27-29, demoing their game to attendees. Trembley, left, and Chatellier, demoed Dice Throne at PAX South last month. Dice Throne is a two- to four-player combat game using unique dice and cards that then interact with a player's chosen hero character; each hero has its own dice and cards that aid it in combat and defense. Fast-paced and quick to learn, the game's basic dice-rolling mechanics are comparable to Yahtzee, but it draws influence and inspiration from other familiar tabletop games, like Magic: the Gathering (the game's turn phases are very similar). Each hero offers a different style of play, and their fantasy archetypes — the game's four core characters include the Barbarian (a tank-y combat fighter), the Pyromancer (spells and fast direct damage), the Shadow Thief (a poison-flinging rogue), and the Moon Elf (ranged, with damage deflection skills) — will be familiar to anyone who dabbles in such realms. "I think we would be silly not to acknowledge that PAX was a massive boost," Trembley says. "It was incredible going there and meeting people who came and said 'We saw you were going to be here and we want to play your game.'" Chatellier agrees. "So many played the game at PAX who played hours and hours, and they posted those comments on our Twitter and Kickstarter, and that gave a lot of confidence for people who hadn't played it," he says. A game blogger who experienced Dice Throne at PAX wrote: "Dice Throne was definitely my tabletop game of the show… but in truth I think probably it was my game of the show as a whole. I highly suggest if you have the opportunity to check this out at any conventions between now and the projected November release date that you grab hold of it with both hands." Part of Dice Throne's mass appeal, Chatellier argues, is thanks to the game's colorful artwork created by Trembley, who has published numerous graphic novels; most of which have seen first-print runs thanks to the support of Kickstarter backers. (We first learned about Dice Throne when profiling Trembley last year). "Tons of people said the game was intriguing, but the art is what made them read the description," Chatellier says. "It's kind of a perfect storm. The art is really connecting with fans; the bright colors, and the game play is fairly unique." This is the first game they've teamed up to design through their venture Mind Bottling Games, and both bring extensive experience in video game and app development. 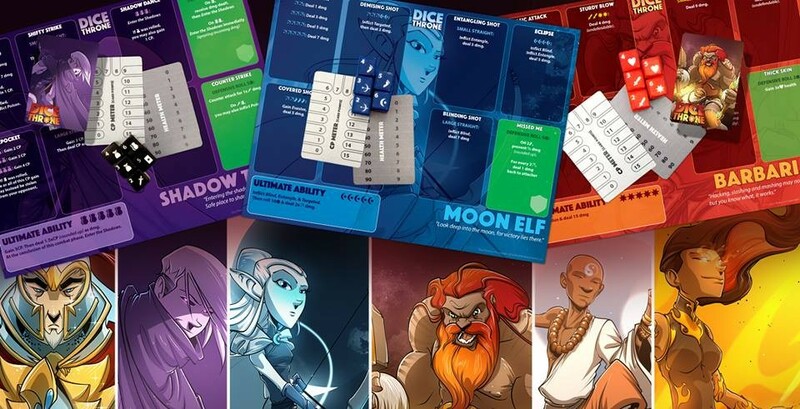 After Dice Throne's Kickstarter run wraps up on Feb. 24, its designers hope to launch online pre-orders to be shipped later this year around the same time as backer rewards. But if the game sounds like something you'd be interested in, don't wait to back it. Chatellier says this will be the lowest price offered; plus, several stretch goals have already been unlocked including two additional hero characters, the Paladin and the Monk.